The network was created in 1999 and initially relied upon a distributed query model based on the Z39.50 search/retrieval protocol. Over the years, FishNet has transitioned through a number of technological improvements. The modern search portal relies upon a core web service known as the Biological Object Search Service (BOSS) which is comprised of a series of software and database components that harvests data from providers, imports harvested data into a data cache and exposes the data cache via publicly accessible web based APIs. 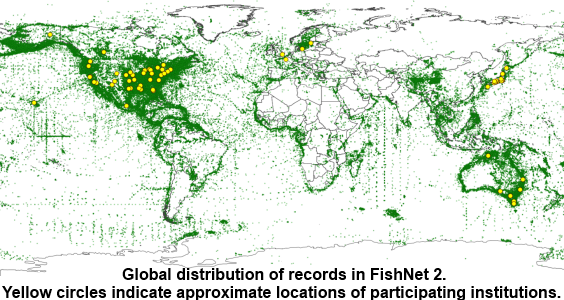 The architecture for FishNet 2 has been mirrored to provide similar search portals for reptile and amphibian data within HerpNET and bird data within ORNIS.